Timelessly beautiful. This stunning, created sapphire and cubic zirconia 9ct white gold ring makes for the perfect proposal. Featuring a traditional four claw setting. 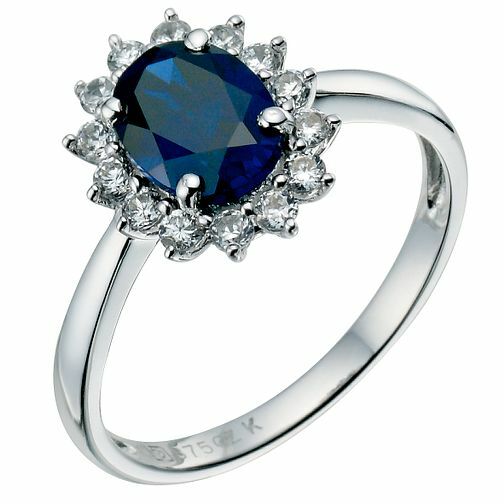 9ct white gold created sapphire cluster ring is rated 4.9 out of 5 by 7. Rated 5 out of 5 by Anonymous from The stone of wisdom and royalty I bought this ring for my older sister as sapphire is her birthstone and she was over the moon. It's a stone of wisdom and royalty and a truly stunning ring. Rated 5 out of 5 by Anonymous from Perfect Ring Beautiful ring and perfect for a vintage engagement ring.